Deliciously moreish. Natural flavours. 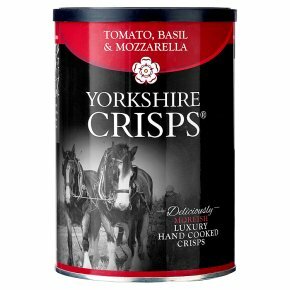 Luxury hand cooked crisps in a stayfresh resealable drum. Suitable for vegetarians.Inspecting the harvest of our potatoes grown on the Yorkshire Wolds. These potatoes were crisps on the same day! What's in the drum? Locally grown potatoes, pure sunflower oil, totally natural flavourings and tender loving care. (Full ingredients are on the base) What's not in the drum? Monosodium glutamate, artificial flavourings and colourings, preservatives or anything genetically modified. Why? We wanted a range of crisps with natural ingredients that complement a drink. We present them to you in a container that is right for sharing between friends.